Ticketing Kiosks are not new to the industry of self-service applications as most major transportation companies and entertainment ticket distributors already utilize this solution in one form or another. Most of the ROI benefits of ticketing kiosks come in measurable increments, while others are subtle benefits that still ultimately impact a company's bottom line. One of the major benefits of self-service ticket kiosks is the overall reduction in cost per transaction. This is primarily due to the reduction in costs related to employees since less staff is needed. Ticket Kiosks also help improve customer satisfaction by making transactions faster and more convenient. Monetary transactions are simplified as ticketing kiosks accept various payment methods including credit cards and cash. This also significantly reduces the time commitment for each transaction making it more efficient while preventing long congested lines. Installing ticketing kiosks on off-site locations can increase revenue by offering more distribution locations for customers to visit. This also contributes to lower infrastructure costs by making these transactions automated. In addition, ticketing kiosks allow owners to easily and effectively communicate with their customer base through well-constructed applications. These provide the ability to update content on special promotions, up-sell items and introduce new product or service offerings. Having the ability to communicate with customers increases revenue and the amount of sale per transaction. 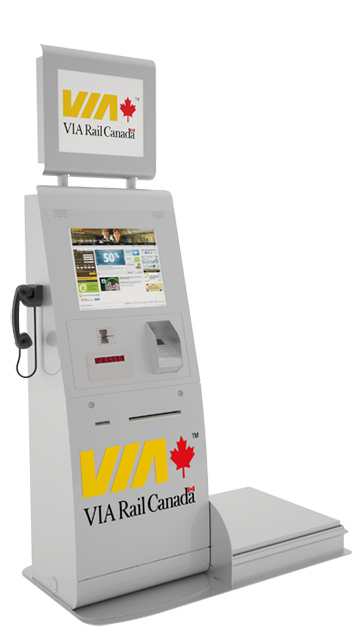 Ticket Kiosks also offer the security of knowing that there is no room for human error. The applications are completely accurate and eliminate the possibility of mistakes or miscalculations.